The pink swimsuit is the girls version and the polka dot is the ladies version. 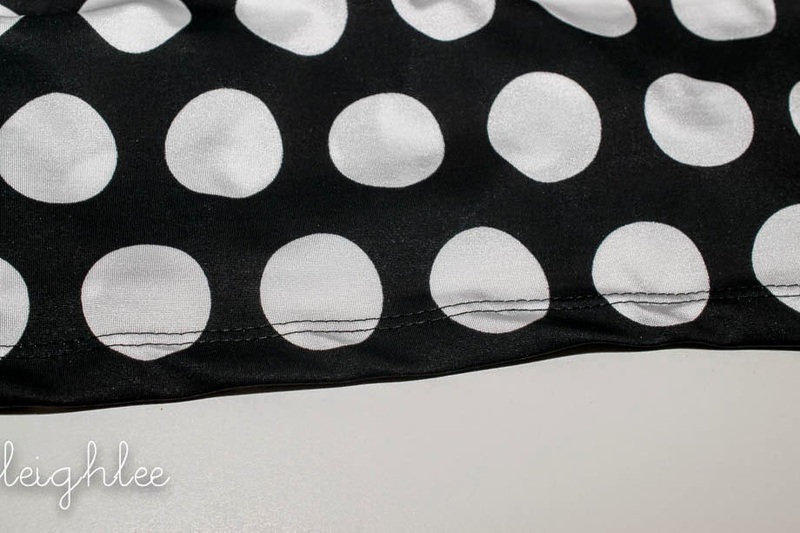 If you are making the ladies version, skip ahead to the polka dots. You should have a stack similar to this. Tank front and back, ruffles, neck binding, arm binding and elastic. 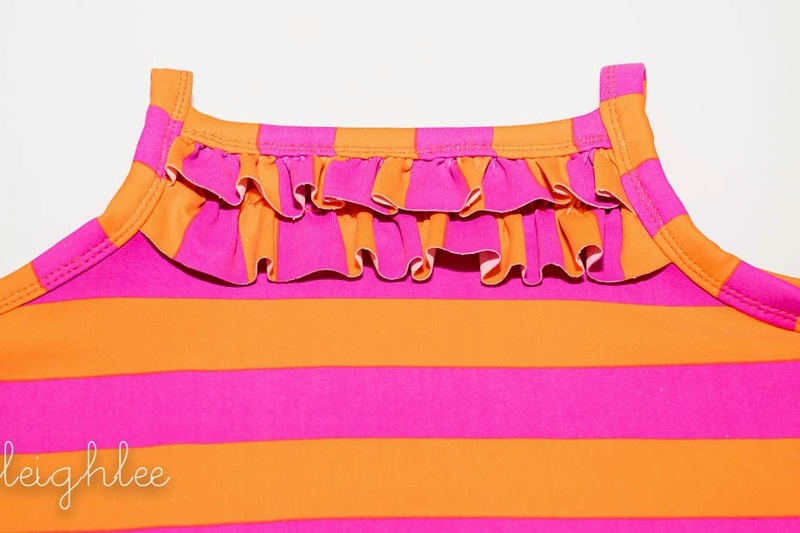 Let's start with the ruffles. 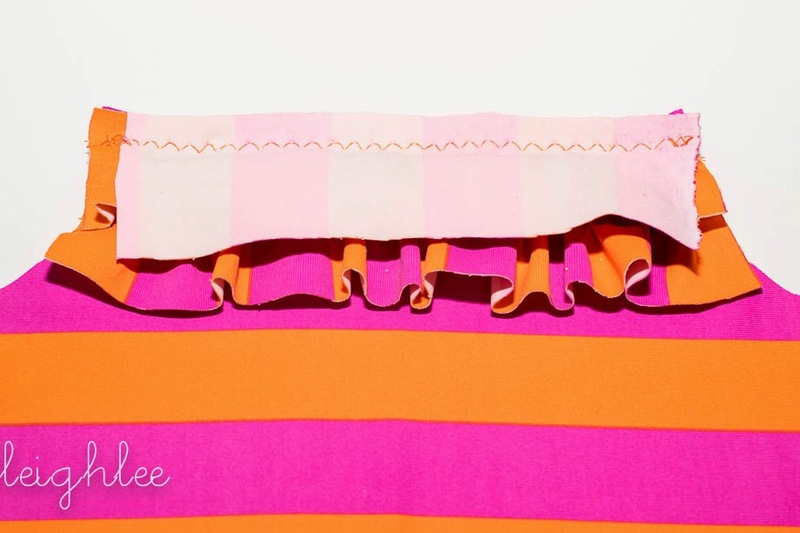 Mark the elastic and ruffle strips into thirds. 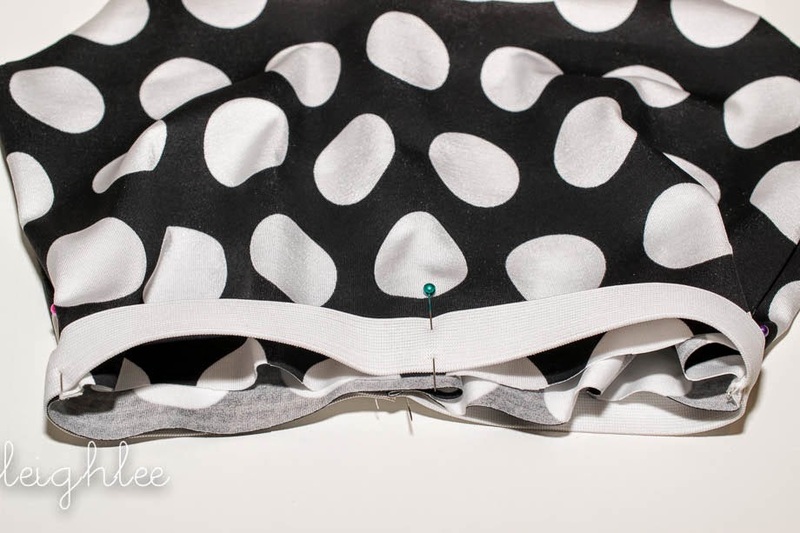 Line up pins and attach the elastic to the wrong sides of the ruffles. 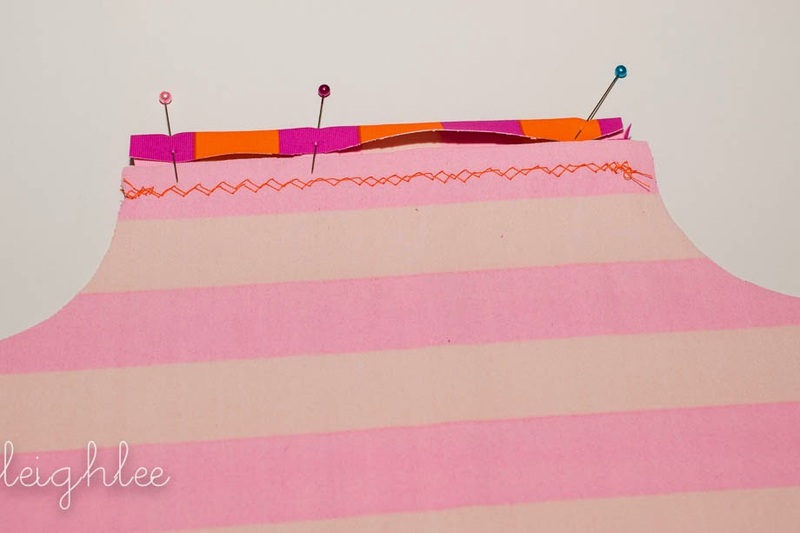 Using a zig zag stitch, stretching elastic from both sides so elastic lays flat against the ruffle. 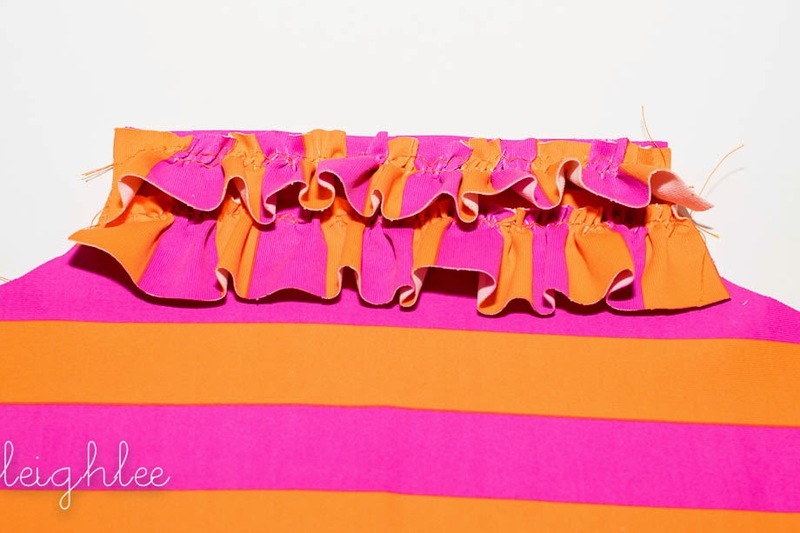 Attach elastic to the ruffle. 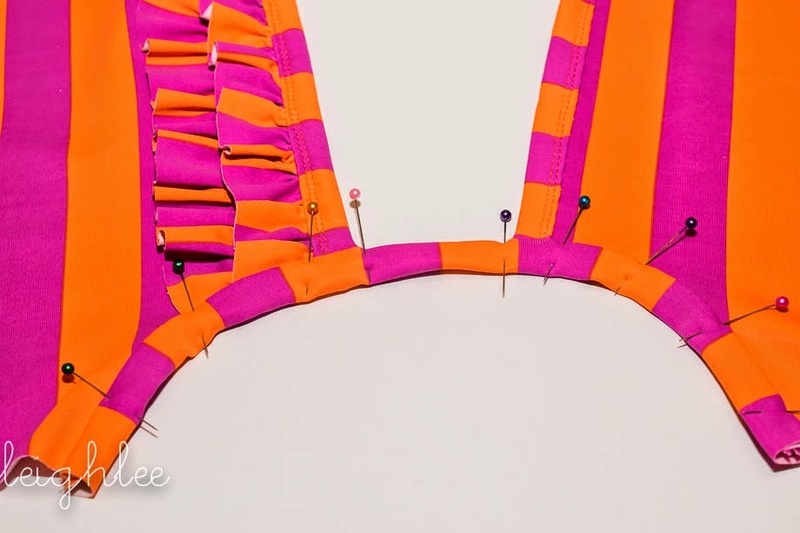 Draw a straight line across the front bodice. 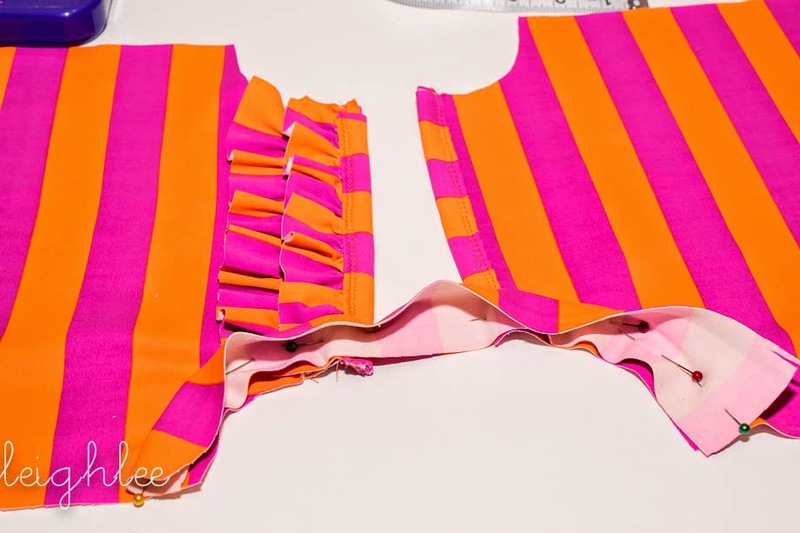 Attach the ruffle piece along the line with a zig zag stitch. 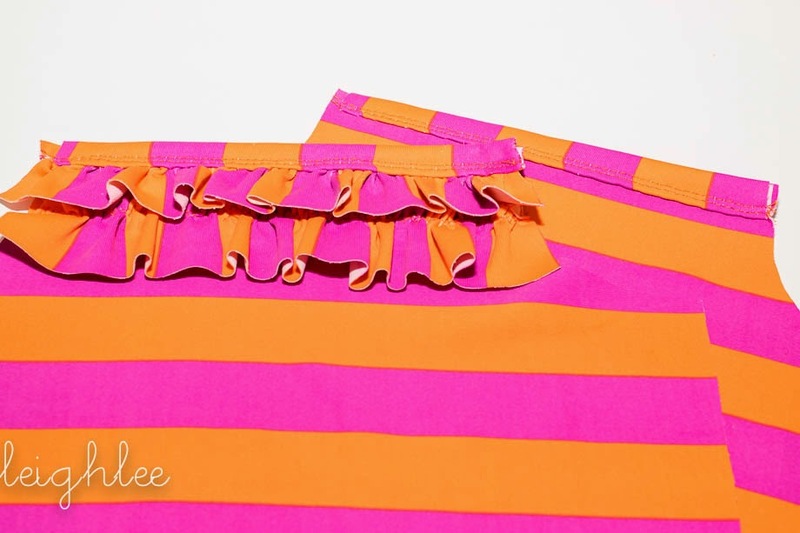 Repeat with the second ruffle strip. Attach elastic and then attach ruffle above the first ruffle. Attach the binding to the front bodice piece. Line up binding piece right sides together to the bodice. Fold binding piece up and iron flat. Fold the top edge in toward the center of the binding. Fold binding piece in once again to enclose the entire top edge of the tank. Repeat with the second binding strip. 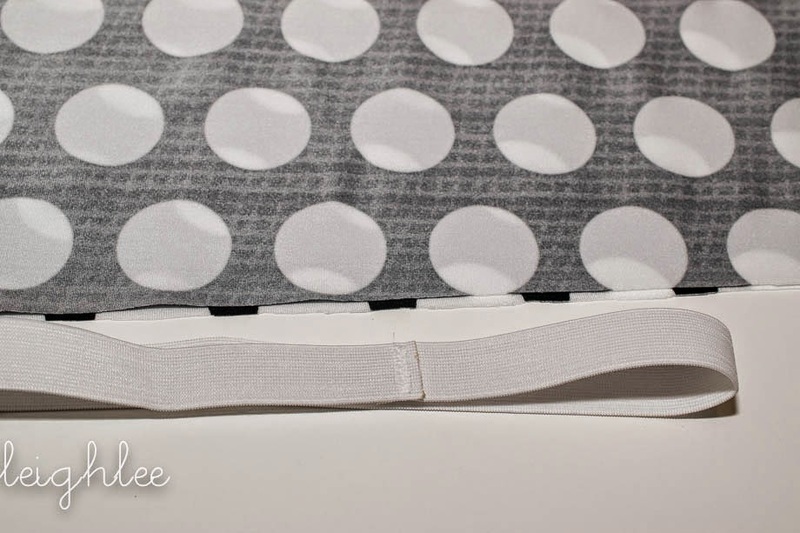 Let's work on the arm hole binding strips. 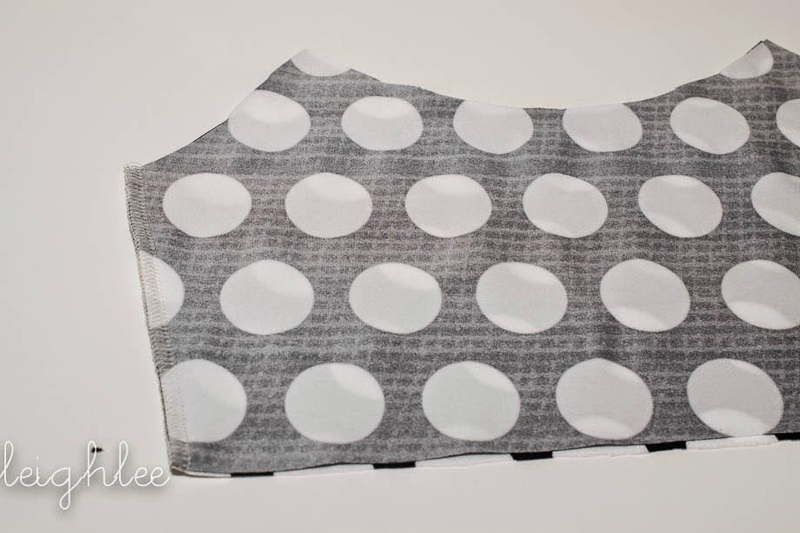 The process for the arm holes is the same as the bodice front binding. Line up one edge of the binding with the raw edge of one armhole. Keep the binding straight and attach the opposite end of the binding to the raw edge of the bodice back, right sides together. 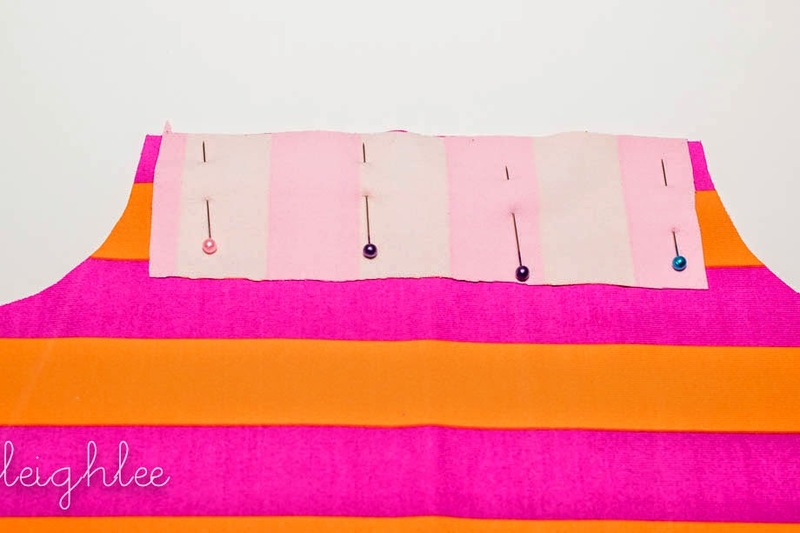 Attach with a zig zag stitch. Repeat the same steps as above for finishing the binding. Here is what the binding looks like at this point. 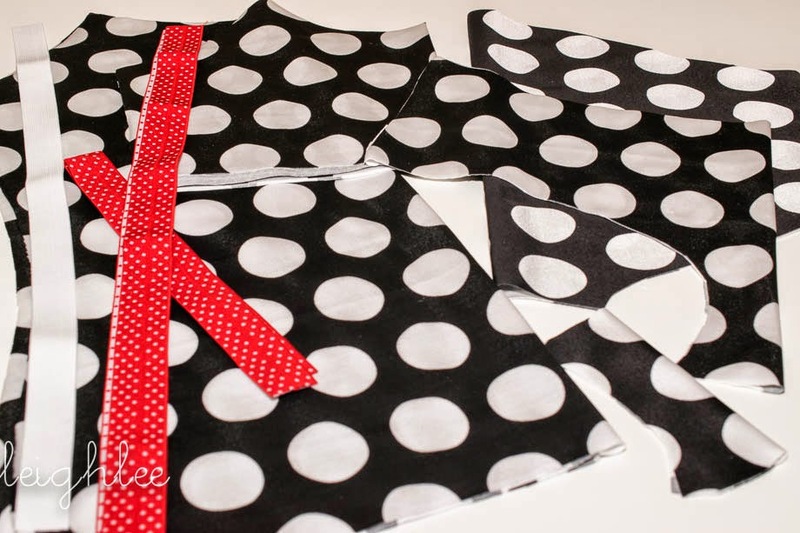 The bodice front and back are attached with the binding strip. The binding will be the shoulder straps. Repeat the binding process on the opposite armholes. Ladies version. You will have a pile similar to this with all pattern pieces. 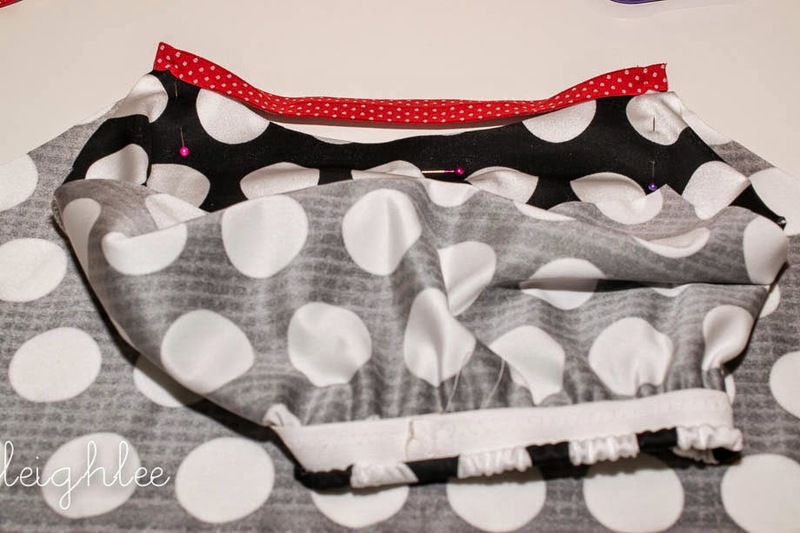 Bodice front/back, shelf bra pieces, briefs front/back, elastic. Begin with the shelf bra. If you would like to add molded cups, click here for instructions. Attach front and back pieces. Sew elastic together in a circle. Mark elastic evenly with 4 pins. Do the same with the shelf bra. 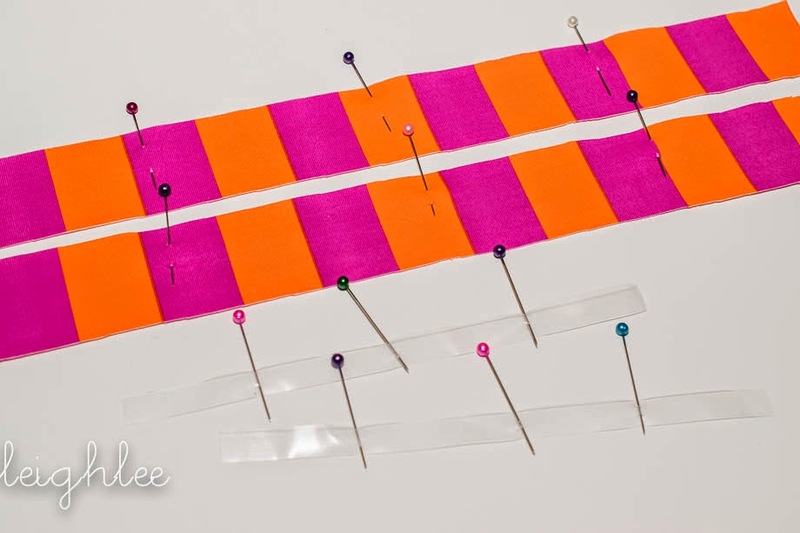 Line up pins to attach elastic. 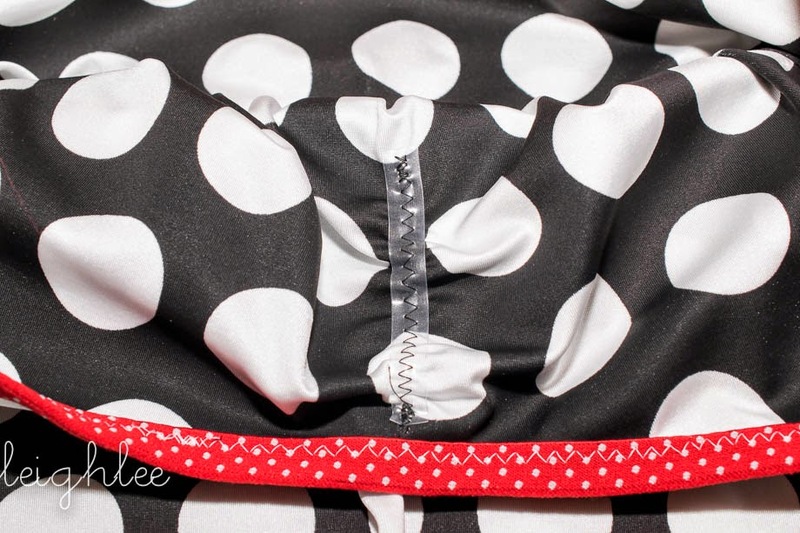 Gently pull on both sides of the elastic to stretch it to fit the bra. 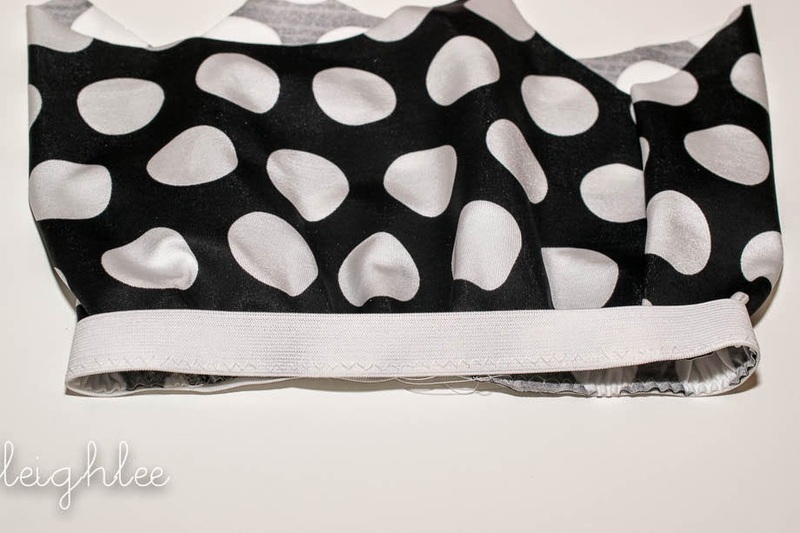 Turn the elastic toward the wrong side of the bra. 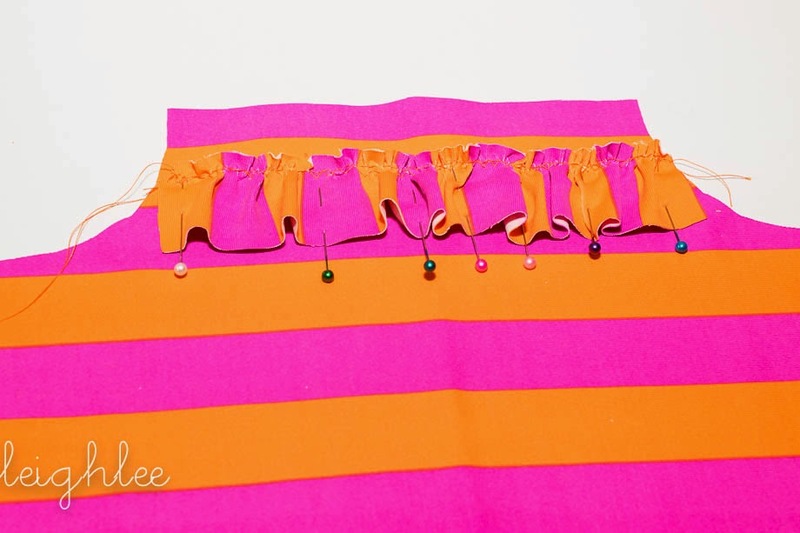 Stretch the elastic and zig zag stitch in place. Pin shelf bra to the tank at the neck, wrong sides together. 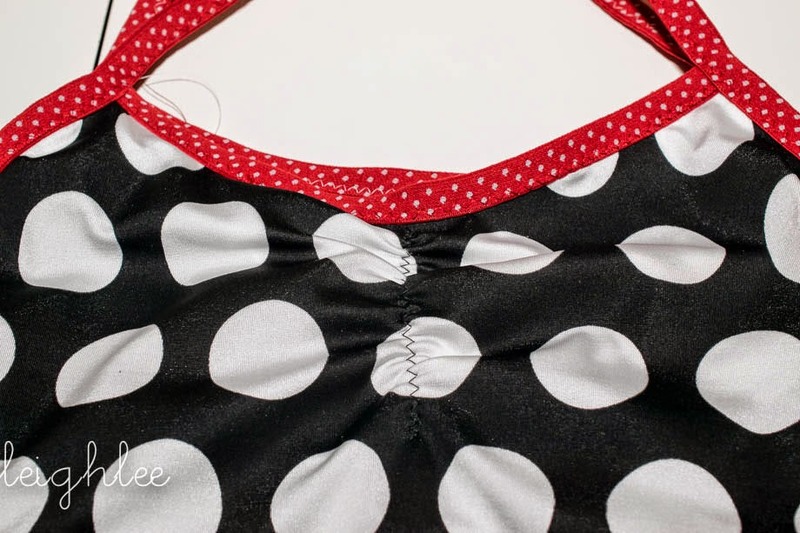 Using FOE (fold over elastic), bind bodice front and repeat with bodice back. 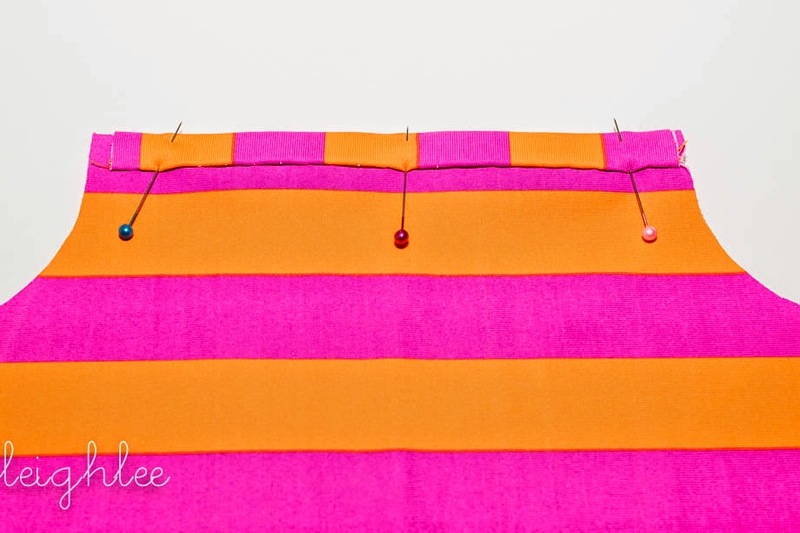 If you are using regular bias, follow directions for binding above. Using a 4 in. 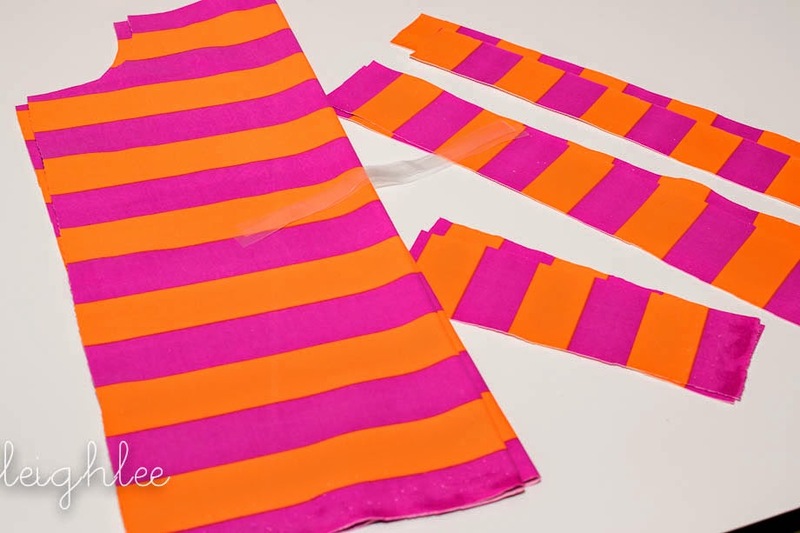 strip of elastic, gather the center front to create a little shape in the swimsuit top. 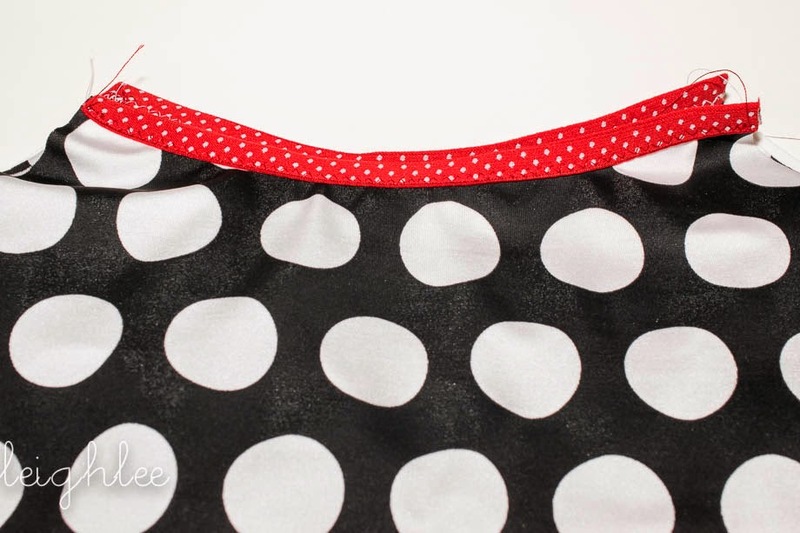 Gather by attaching the elastic at the top of the bodice and 6in. down. Stretch the elastic to create a gather. Repeat binding on armholes. If you need more explanation, scroll up to the top. Tomorrow we will finish the side seams and work on the brief bottoms.